Yep ... it's Jesse James' girlfriend ... the tattoo model who apparently was one of a few thousand young ink covered ladies that Jesse played with when Sandra (America's Sweetheart) Bullock was not around. There is not a person on earth who has forgiven him for what he did and few can understand why he strayed. Sandra Bullock ... of all people. The reason was in an obscure publication that I read just the other day ... and no one has put two and two together ... except for me! His ring finger is longer than his index finger. The ratio between index and ring finger is believed to be linked to exposure to the male hormone testosterone in the womb. On average, men tend to have longer ring fingers and women longer index fingers. 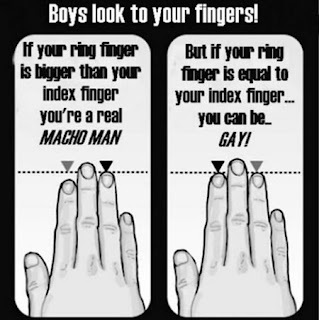 The higher the testosterone, the greater the length of the ring finger and the more "masculine" the resulting child – whether male or female. The longest ring finger is known as the "Casanova pattern". A new study just released from University of Alberta reveals that men with longer ring fingers compared to their index fingers tend to be more physically aggressive. Actually, I've been aware of this for some time. The picture (LEFT) was taken in my single days. Thank heavens I found out about a rare hand transplant procedure ... before I met Debbie. HAHAHAHA! That is hilarious! 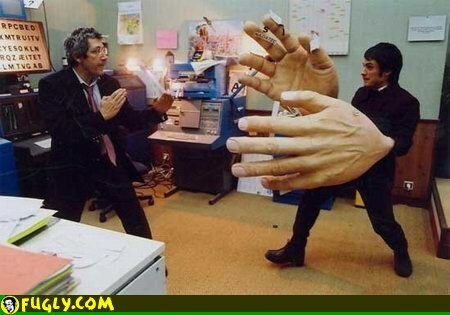 Maybe you should have kept those big hands. I think they would've come in quite "handy" in laying the smack down on Mr. Jesse James. What an IDIOT! If that finger test stands to be correct...I think I may be a lesbian. Congrats on 50 Followers, where's the party! @Toni ... Hey ... I'm a lesbian too! And I still have a long ring finger ... but love girls. @ kcl ... LOL ... thanks! You name the place and we'll celebrate. Thanks!